Russia’s Progress 60 caro spacecraft is seen in its processing facility at the Baikonur Cosmodrome in Kazakhstan being prepared for its July 3, 2015 launch. A robotic Russian cargo vessel will try to buck a negative recent trend when it launches toward the International Space Station early Friday morning (July 3). 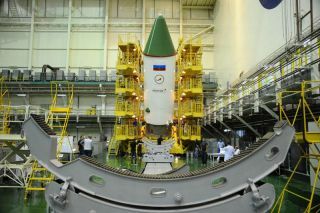 Russia's Progress 60 freighter is scheduled to blast off atop a Soyuz rocket from Baikonur Cosmodrome in the central Asian nation of Kazakhstan at 12:55 a.m. EDT Friday (0455 GMT, 10:55 a.m. local time in Kazakhstan). The launch comes just five days after SpaceX's Falcon 9 rocket exploded less than 3 minutes into flight, ending the California-based company's seventh contracted cargo run to the orbiting lab for NASA — and about two months after the previous Progress freighter (Progress 59) fell back to Earth, victimized by a problem with its Soyuz booster. So it's safe to say that people in the aerospace industry and the human-spaceflight community will be watching Friday's launch from Baikonur pretty closely. The spate of cargo-mission setbacks has not endangered astronauts aboard the $100 billion orbiting complex. Crewmembers have enough supplies to last through October as things currently stand, NASA officials have said. Progress 60 will give the astronauts and their controllers here on Earth a little more breathing room, if everything goes according to plan. "The Progress is loaded with 1,940 pounds [880 kilograms] of propellant, 106 pounds [48 kg] of oxygen, 926 pounds [420 kg] of water and 3,133 pounds [1,420 kg] of food, spare parts, logistical items and experiment hardware," NASA officials wrote in an update Tuesday (June 30). The freighter is scheduled to arrive at the space station at about 3 a.m. EDT (0700 GMT) on Sunday (July 5). The space station is currently home to cosmonauts Gennady Padalka and Mikhail Kornienko, and NASA astronaut Scott Kelly. Kornienko and Kelly are about three months into an unprecedented yearlong mission aboard the orbiting lab. Three more space fliers will join this trio soon: cosmonaut Oleg Kononenko, NASA's Kjell Lindgren and Kimiya Yui of Japan are slated to launch toward the station aboard a Soyuz spacecraft on July 22. Another robotic cargo mission will blast off shortly thereafter: Japan's fifth H-2 Transfer Vehicle (HTV) is set to launch in mid-August.